Brushing your little one's teeth just got easier with this baby gorilla demonstrating the process. These photographs are open edition prints, professionally printed for you with a luster finish on premium acid-free photographic paper that will resist fading for generations in typical home display. They will be carefully shipped (un-matted & unframed) in sturdy moisture-resistant packaging. Your photos will be high resolution, fine art prints. They have been adjusted here for web viewing. The watermarks will not appear on your photographs. Printed colors may vary slightly from those viewed on your monitor. The images of framed photos are only examples to demonstrate how the prints might look matted and framed. They are not to scale. Please keep in mind that the effect of these photographs on your wall will depend on the size of prints you order, your room dimensions and your furniture. 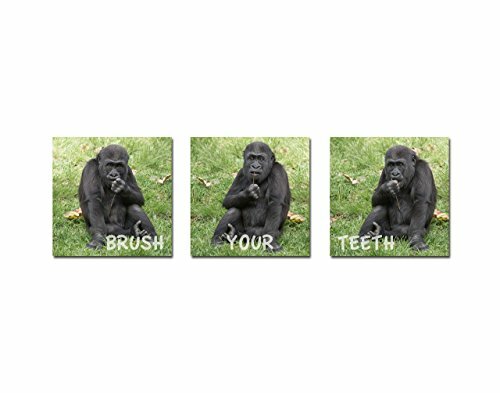 You can find these images as canvas prints and in other variations by searching Amazon for 'Nancy J's Photo Creations gorilla'.